Like a cool wintery day on a weekend escape, this Emerald-Cut Aquamarine Solitaire Ring evokes images of water and ice and the natural beauty of snow-capped mountains. The varying shades of blue in the stone shift with the light making it an eye-catching piece. This ring features a large emerald-cut aquamarine stone (6mm by 8mm) with a stunning translucent nature that is truly like gazing upon frozen water crystals as they sparkle in the sunlight. Keeping in theme with the hues in the aquamarine stone, both the setting and the band are carefully cast in 14k solid white gold. The four points of the gold setting can be seen holding the stone in place on all four corners, attached to the sleek-looking band (4mm) polished to perfection with the velvety appeal of a satin finish. This uncomplicated ring creates a wonderful ambient feeling of cool confidence and intrigue. 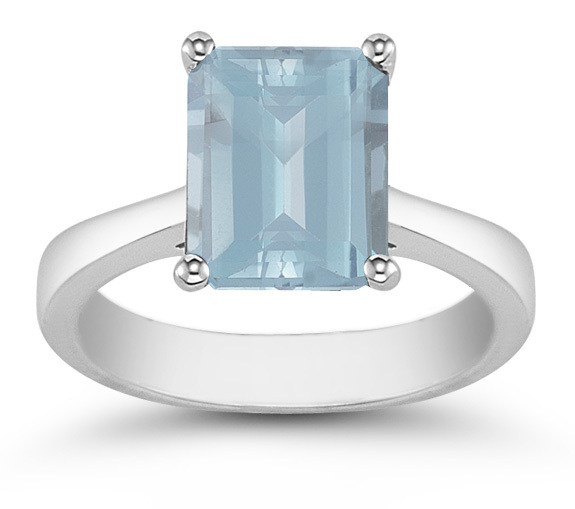 Its modern design along with the rectangular-cut stone create ideal conditions for this unique blue aquamarine gem to stand out as the stunning feature of the ring. We guarantee our Emerald Cut Aquamarine Solitaire Ring, 14K White Gold to be high quality, authentic jewelry, as described above.